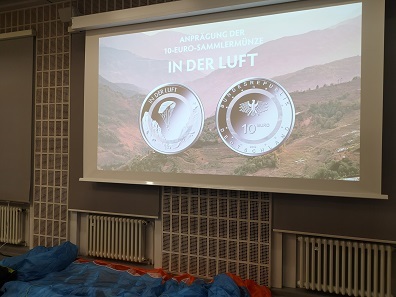 November 22, 2018 – On November 14, 2018, the first-strike ceremony of the new 10 euro collector’s coin “In the Air” took place at the Karlsruhe Mint of the State Mints of Baden-Wuerttemberg. 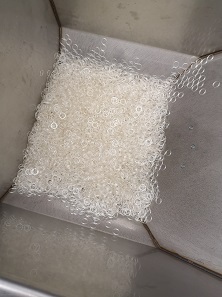 The research group, who developed the revolutionary minting technology of placing a polymer ring between the outer ring and the inner core, has already been honored with multiple awards. The 5 euro coins with polymer rings that were issued in the past two years, have proven incredibly popular amongst collectors. Now, the new technology will also be applied to 10 euro coins. The first issue of the new “Air Moves” series will be available for purchase in both FDC and proof quality in spring of 2019. The obverse features a paraglider flying high up in the mountains. The design on the front face was created by Natalie Tekampe from Müncheberg. The rear face was designed by Andre Witting in Berlin, © BVA. 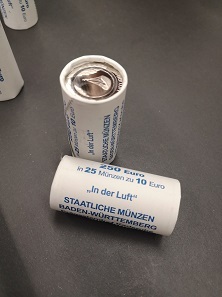 In his welcome address, the mint director of the State Mints of Baden-Wuerttemberg, Dr. Peter Huber, did not only present the new commemorative coin, but he also took advantage of the occasion to say a few words about cash in general. His comments on the advantages of cash were targeted at all the critics and skeptics who are envious of the developments in Sweden, a country where cash is used less and less frequently. His five “Cash Lover Arguments” were quite convincing. Peter Huber argued that cash was inexpensive, reliable, secure, educational, and disaster-resistant. We can thus assume that he is pleased to know that most Germans seemingly hold on to their predilection of coins and banknotes. Attendees could compare the depiction on the coin to a real paraglider as well. Photo: LS. The Finance Minister of Baden-Wuerttemberg, Edith Sitzmann has taken the time to witness the first strike of a commemorative coin at one of the state mints a few times already. However, the minister pointed out that it was always a great pleasure and one of the most enjoyable tasks in the everyday political life. She began her short welcoming speech with a quote by German writer Karin Büchel, which matched the new three-piece series perfectly: “Geld ist wichtig. Luft zum Atmen ist lebenswichtig.” (engl. “Money is important. The air we breathe is essential.”) The minister said people had always considered flying a symbol of freedom. Now it had finally found its way onto a commemorative coin. Two of the three parts of the tri-material coin. Photo: LS. From Icarus to Otto Lilienthal – they all had the same dream: they wanted to see the world from up above. But for the longest time, any attempt at flying resembled a “controlled fall” more than anything else, as Bernd Böing described it. The vice-chairman of the German Hang-gliding Association (DHV) traced the history of flying and pointed out that it was the U.S. American engineer Francis Rogallo who developed the flexible parawings that continue to keep those strapped under paragliders and hang-gliders up in the air to this day. Böing emphasized that it was an incredible honor that Germany, too, had decided to dedicate a coin to his sport. Until now, he had always been a little jealous when his Swiss colleagues proudly displayed their 50 francs banknote. He said he would surely bring along one of the new polymer coins as a gift during his next flight with his neighbors in the south. All those involved in the process are very proud of this milestone in the development of minting technology. Photo: LS. After a short introduction by Prof. Dr. Andrij Pich on the chemical composition of polymer and an explanation of the developmental stages of its production, the hands-on part of the afternoon began. 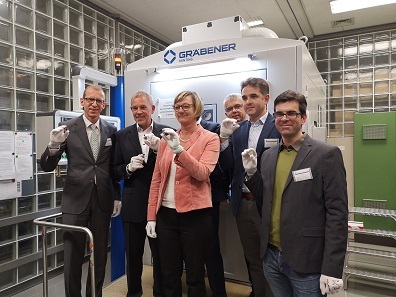 Finance Minister Sitzmann first started the machine that joins the three pieces of the FDC coin, before she set in motion the striking of the first 10 euro commemorative coin with a polymer ring in proof quality. The FDC 10 euro polymer coins are already rolled up, but not yet available. Photo: LS. A total of 1.5 million pieces of the FDC coin will be minted. A few dozens already rolled onto the conveyor belt on Wednesday. 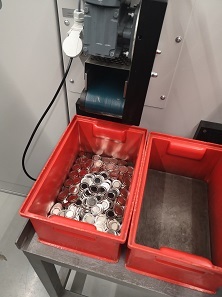 250,000 proof coins will be struck in the only proof minting press with servo motor transfer in Europe. The new 10 euro commemorative coin “In the Air” will be available at the Official Sales Agency for Collector’s Coins of the Federal Republic of Germany in early 2019. CoinsWeekly published a detailed analysis of what makes these polymer coins so special as well as a report on a visit to the Karlsruhe Mint. The polymer technology was first used for the 5 euro commemorative coin “Planet Earth”, which was honored with the popular MDC Award, the IACA Award for Best Coin Innovation, as well as the Coty 2018. More information on the history of paragliding and hang-gliding is available on the DHV website. This link will take you to the State Mints of Baden-Wuerttemberg website.